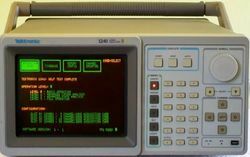 The Tektronix 1240 is a logic analyzer, introduced in 1984. The 1241 is the same device but with a color-shutter CRT, it was introduced in 1986. The 1240/1241 accommodate one to four acquisition boards of type 1240D1 with 9 channels or 1240D2 with 18 channels for a total of up to 72 acquisition channels. Acquisition speeds reach up to 100 MHz asynchronous or 50 MHz synchronous. The 1240/41 provides 14 levels of triggering with conditional branching. There are two cartridge interfaces. One is for I/O devices; three were produced. The 1200C01 is the RS232C Comm pack. The 1200C02 is the GPIB comm pack. The 1200C11 is the parallel printer comm pack. It required the 12RC01 Printer Support ROM pack. The other cartridge interface was memory specific and was for ROM and RAM packs. Both 8K and 64K RAM packs with battery backup were made, note that the battery is a potential HazMat made by Catalyst Research and may destroy the cartridge when it leaks. There were also ROM packs that allow for mnemonic disassembly and state analysis of most microprocessors of the time. The ROM packs were made with a generic PCB that had two socketed ROMS and jumpers to select the size. See the Microprocessor support table for processor configuration options. It uses either P6460 or P6462 9-channel probes depending on the installed card. The 1240 is built around an Intel 8088 as the control processor with 64K DRAM, and firmware in a bank of EPROMs. A separate I/O processor board is powered by a Zilog Z80A CPU. The display controller is built from individual TTL and ECL ICs. The power supply is a switch-mode supply that mainly generates 5 V at up to 45 A. It requires a minimum load of 11.6 A. Additionally it generates 3 V at up to 8 A with no minimum load and several other voltages that are derived from linear post regulators. Boards are two to six layers. The CPU board has battery backed up RAM to save the current configuration and one user config. This battery is a potassium hydroxide electrolyte cell. It will eventually fail and leak, damaging the PCB. The battery is visible on the picture for the A09 processor board. This page was last edited on 17 April 2019, at 03:30.